It is the stuff that James Bond movies are made of: the half-brother of an iron-fisted dictator is killed by a pair of femmes fatales, who use gadgetry to poison him in public. But as details emerge about the death of North Korean leader Kim Jong Un's half-brother, that scenario appears to be not particularly far-fetched. Reports in the Malaysian media suggest that Kim Jong Nam died after two women used either needles, spray, or a chemical-soaked cloth to fatally poison him at an airport. NBC News has been unable to confirm those details. But this would not be the first time that assassins have turned to poison as a tool of their trade. Here’s a look at a few famous examples. A former member of Russia’s FSB security service, Litvinenko fell afoul of his masters after publicly claiming that he had been ordered to kill two other Russian spies by his superiors. He fled to London. Litvinenko suddenly became ill on Nov. 1, 2006, after meeting two former KGB agents, Andrei Lugovoi and Dmitry Kovtun, in the bar of an exclusive hotel. His condition quickly worsened — pictures in the press showed that all of his hair quickly fell out — and he died Nov. 23 of "acute radiation syndrome." 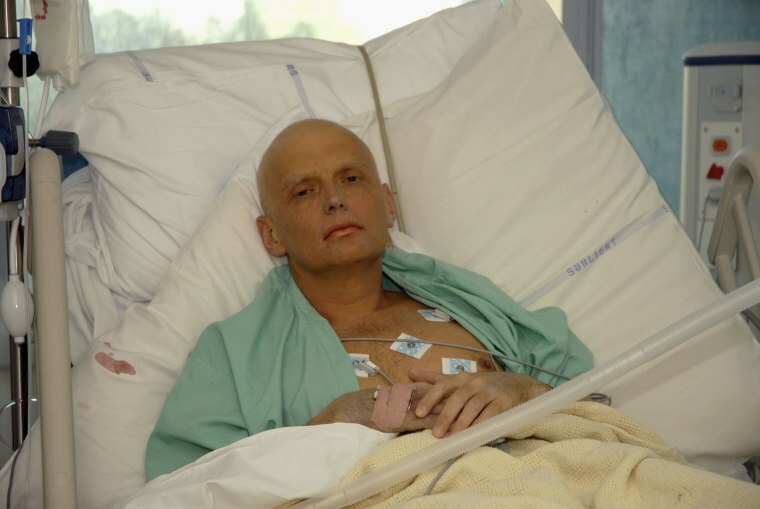 A British government inquiry found that Litvinenko had been killed by ingesting radioactive material — polonium-210 — which it alleged Lugovoi and Kovtun used to poison Litvinenko’s tea. The pair, who remain in Russia, deny any involvement. The inquiry's report also said that the killing was probably approved by Russian President Vladimir Putin, a claim Litvinenko himself made before his death. The Bulgarian journalist and dissident’s murder was one of the most high-profile and sensational assassinations of the Cold War. While waiting for a bus on London’s Waterloo Bridge in 1978, Markov was stabbed in the thigh with a poisoned umbrella tip and died four days afterwards. Authorities discovered that the umbrella had injected a small pellet containing the poison ricin into Markov’s leg. No-one was ever arrested in connection with his death, though the KGB and Bulgarian spies are widely suspected to have been behind the killing. During the bitterly contested 2004 Ukrainian presidential election, candidate Yushchenko developed an illness that caused massive facial scarring and swelling, as well as a host of other near-fatal medical complaints that knocked him off the campaign trail for several weeks. Medical examinations revealed that his illness was the result of dioxin poisoning. Yushchenko recovered and went on to win the Ukrainian presidency after repeated run-off votes. In 2008, Yushchenko said that he believed that a former ally, David Zhvania, who was godfather to one of his children, was involved in his poisoning. He suggested it took place at a dinner with Zhvania and two security officials. Prosecutors were unable to identify any suspects in connection with the incident. Agents from Israel’s Mossad intelligence service tried to kill the Hamas leader in 1997 by spraying a substance into his ear as he walked on a street in Amman, Jordan. The Israelis plan, however, quickly fell apart. Both operatives involved in the attempt were captured, and Jordan’s King Hussein threatened to hang them in a public square unless Israel provided an antidote to the poison, which it did. Israel was forced to free a number of Palestinian prisoners to secure the captured pair's release. Ariel Sharon, then-Israel’s infrastructure minister but who went on to be prime minister, pledged that the country would try to kill Mashaal again.